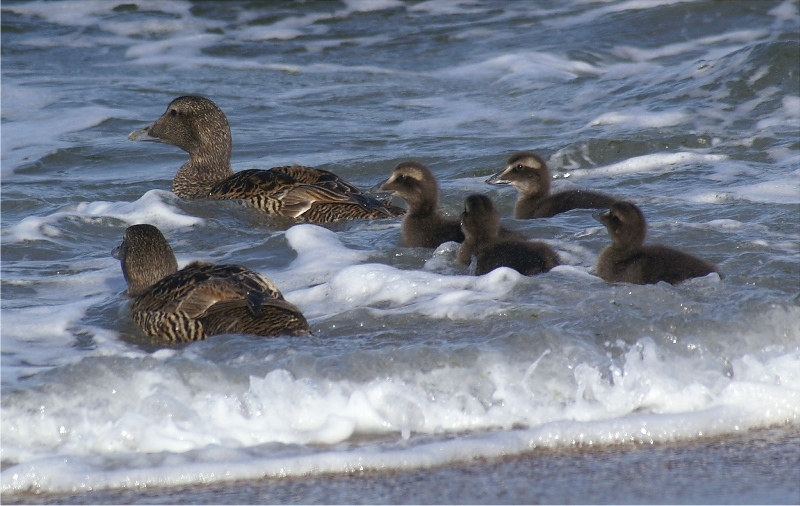 Eider ducks are common birds in northern Britain, but genetic studies suggest those in Shetland are closer to the Faroese race than those breeding in mainland Scotland, which makes them of special conservation concern. 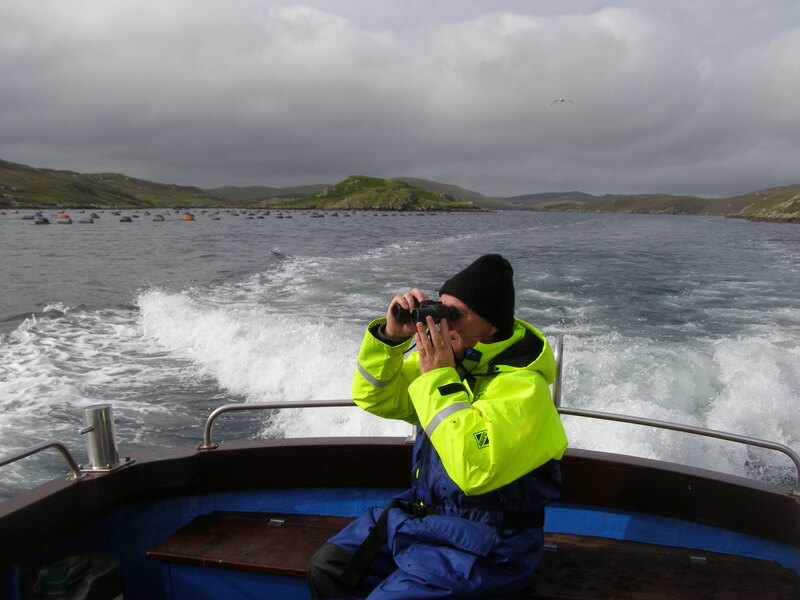 They are vulnerable to inshore oil pollution, and the Shetland Oil Terminal Environmental Advisory Group (SOTEAG) has monitored their numbers in the islands for over 30 years. Although essentially resident within Shetland, Eiders make seasonal movements around the isles, and shift their feeding locations in response to short-term weather conditions. However, in late summer adults become flightless during their annual moult and by August flocks are restricted to a swimming distance of about 3 km, and are therefore relatively easy to locate and count. Surveys in the 1970s found these flocks used the same headlands or offshore skerries each year, where they could feed, roost ashore, and find shelter in varying wind directions. The population was estimated at 17,000 birds in 1977, but the Esso Bernicia oil spill in winter 1978/79 and an unexplained die-off in the main Bluemull Sound wintering flock in 1979/80 reduced this to 12,000 by the early 1980s, with a further decline to 6,000 birds by 1997. The January 1993 Braer oil spill, and oiling incidents around Bressay between 1992-96 associated with east European fish factory ships contributed to this decrease to some extent, but could not account for this halving of the population. Predation of ducklings by gulls and skuas is another probable contributory factor, although the scale of this has never been properly studied or compared with areas where numbers are stable. The situation became complicated in the early 2000s as increasing numbers of Eiders began spending the summer near aquaculture sites. Flocks were attracted to salmon cages, as well as the increasing number of mussel lines, and it was not until August 2009 that a survey managed to cover every aquaculture site, and every traditional moulting location. The 5,800 birds counted suggested little change in the population since 1997, but a major shift in their late summer distribution, with 70% near aquaculture sites in the inner voes. For example, only 164 birds were counted in 2009 at ‘traditional’ sites in south Mainland compared to 1,580 in 1997, whereas numbers between Burra and Vaila Sound had increased from 370 to 2,650. Another survey in August 2012 (Figure 2) covered 90% of Shetland’s coastline (Heubeck, M. & Mellor, M. 2013. Recent changes in the status and moulting distribution of Common Eiders Somateria mollissima in Shetland. Seabird 26: 71-86; abstract at www.seabirdgroup.org.uk). Unexpectedly, the total of 4,600 birds was 20% lower than in 2009, which cannot be explained by differences in methodology or coverage. Again, two-thirds were near aquaculture sites, and while numbers were slightly up in some areas and down in others, the main deficit was between Burra and Vaila Sound, where 1,000 fewer were found. There was no obvious, single cause for this decrease. Between the two surveys, no oil pollution incident was known to have affected Eiders and none were found oiled on beached bird surveys. The decrease affected males and females equally, and counts in winter suggested that as many ducklings survived to immaturity in 2012 as did in 2009. Eiders have generally been tolerated at salmon farms, where they feed on mussels growing on the infrastructure, and find shelter. However, there has certainly been conflict with Eiders feeding at mussel lines, and while various anti-predation measures have been tried out, it is difficult to see how these could have been responsible for the loss of 1,000 birds in just three years. One contributory factor could be increased predation by Killer Whales. Although few attacks on Eider flocks have been witnessed, they have resulted in the death of up to 50 birds in a matter of minutes. Photo-identification has shown that the whales involved have been returning to Shetland each summer, and have been seen hunting seabirds in Faroes, where attacks on Eiders have been known for many years. The 2012 survey was funded by the Sullom Voe Association Ltd., and David Parnaby (FIBO), Penny and Sheila Gear (Foula), Rory Tallack and Howard Towll (Shetland Amenity Trust), and Newton Harper (RSPB) participated. Thanks also to boatmen Jim Dickson, Victor Gray, Jerry Ramsay, George Williamson and Jonathan Wills. The next census is planned for August 2015, and hopefully there will be no further decline in numbers to report then. This entry was posted in News and tagged Eider, Shetland on February 13, 2014 by mkr3.